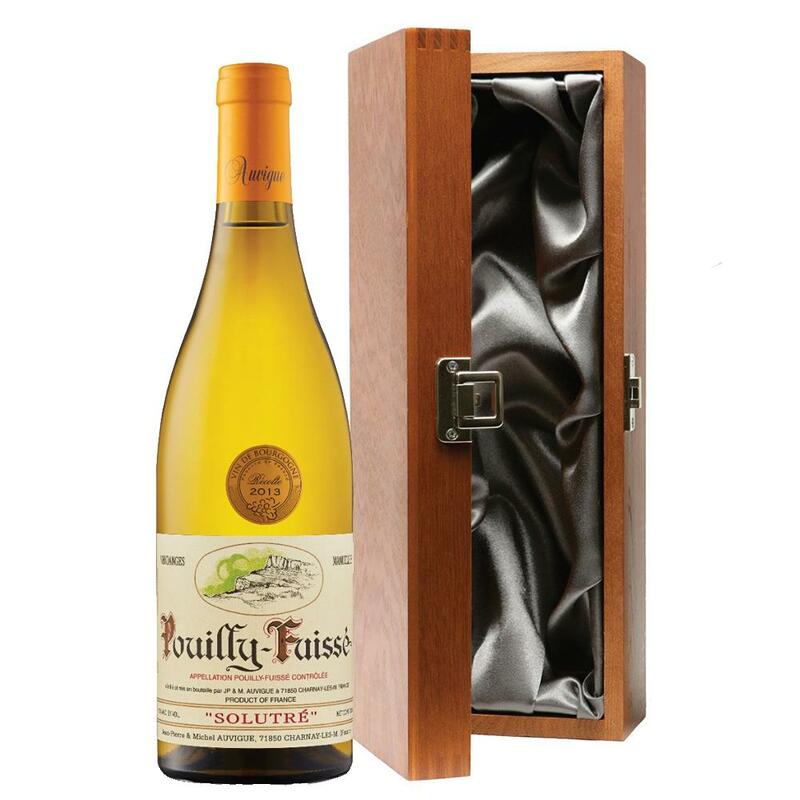 Luxury added to your bottle of Pouilly Fuisse Auvigue with the alluring wooden case with hinged lid. The case is made from wood, which is beautifully complemented with stainless steel hinges and clasp. This case adds the ultimate luxury to any gift and is delicately lined with silver satin. Pouilly Fuisse Auvigue a? A superstar Chardonnay which can proudly boast the highest quality vibrant juiciest fruits. From a traditional low yield winery which concentrates on &apos;quality not quantity&apos; has emerged this deliciously ripe and spicy white wine with a spectacular minerality. From one single vineyard. These traditional winemakers might be small but they are one of the most respected wine specialists in Pouilly Fuisse and Saint Veran. They work on the principles of quality not quantity and the quality is really of the highest level. Headed up by Jean and Michel Auvigue the winemaking here is traditional using wooden cask aging and minimum treatment. This product is hand packed onsite by Bottled and Boxed, and is not affiliated with any other brand. Bottled and Boxed is responsible for this product combination/set.